1 SP Venkatagiri, MC Chan and WT Ooi, "Automated link generation for sensor-enriched smartphone images," ACM Transactions on Multimedia Computing, Communications and Applications, to appear. 1 Kartik Sankaran, Akkihebbal L. Ananda, Mun Choon Chan and Li-Shiuan Peh, "Using Mobile Phone Barometer for Low-Power Transportation Context Detection," ACM Conference on Embedded Network Sensor Systems (Sensys), Nov 2014. 2 Kartik Sankaran, Akkihebbal L. Ananda, Mun Choon Chan and Li-Shiuan Peh, "Dynamic framework for building highly-localized Mobile Web DTN applications," Ninth ACM MobiCom Workshop on Challenged Networks (CHANTS), Sept 2014. 3 Chengwen Luo, Hande Hong and Mun Choon Chan, "PiLoc: A Self-Calibrating Participatory Indoor Localization System," ACM/IEEE International Conference on Information Processing in Sensor Networks (IPSN), April 2014." 4 Manjunath Doddavenkatappa and Mun Choon Chan, "P3: A Practical Packet Pipeline Using Constructive Interference for Wireless Sensor Networks," ACM/IEEE International Conference on Information Processing in Sensor Networks (IPSN), April 2014." 5 Xiangfa Guo and Mun Choon Chan "On the Utility of Overhearing in DTN," ISSNIP, April 2014. 6 Hui Wang,Vu-Thanh Nguyen, Wei Tsang Ooi and Mun Choon Chan "Mixing Tile Resolutions in Tiled Video: A Perceptual Quality Assessment," NOSSDAV, March 2014. 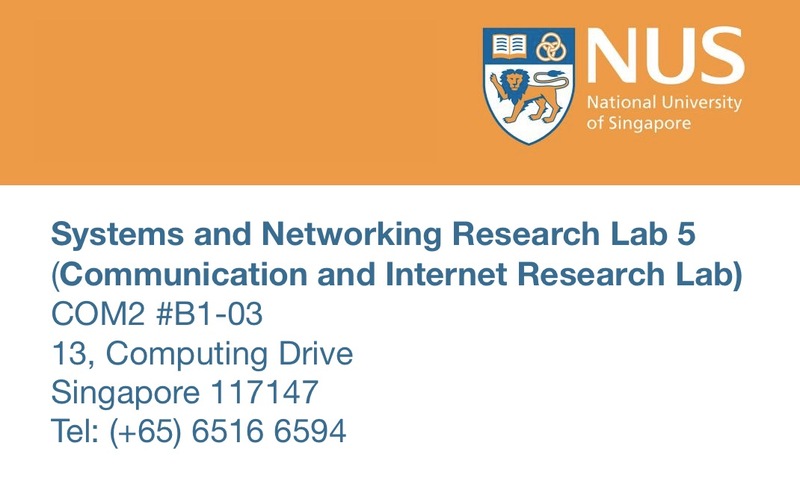 1 Chengwen Luo and Mun Choon Chan, "Collaborative Inference of Human Conversation Networks Using Smartphones," ACM Conference on Embedded Network Sensor Systems (Sensys), 2013." 2 Hui Wang, Wei Tsang Ooi and Mun Choon Chan, " Modeling CSMA/CA Network under Asymmetric Conditions," ACM Workshop on Performance Monitoring and Measurement of Heterogeneous Wireless and Wired Networks. 3 Xiangfa Guo and Mun Choon Chan, "Change Awareness in Opportunistic Networks," International Conference on Mobile Ad-hoc and Sensor Systems (MASS) 2013." 4 Xiangfa Guo and Mun Choon Chan, "Plankton: An Efficient DTN Routing Algorith," IEEE International Conference on Sensing, Communications and Networking (SECON), 2013." 5 Manjunath Doddavenkatappa, Mun Choon Chan and Ben Leong, "Splash: fast data dissemination with constructive interference in wireless sensor networks," USENIX conference on Networked Systems Design and Implementation (NSDI), 2013." 6 M Saini, SP Venkatagiri, WT Ooi, MC Chan, "The Jiku mobile video dataset," ACM Multimedia System Conference, 2013. 1 FC Choo, MC Chan, AL Ananda, LS Peh, "A distributed taxi advisory system," ITS Telecommunications (ITST), 2012. 2 Padmanabha Venkatagiri Seshadri, Mun Choon Chan, Wei Tsang Ooi, " Mobile-to-Mobile Video Recommendation," ACM Mobiquitous, 2012." 3 PG Kannan, SP Venkatagiri, MC Chan, AL Ananda, LS Peh, " Low Cost Crowd Counting using Audio Tones," ACM Conference on Embedded Network Sensor Systems (Sensys), 2012." 4 A Bhojan, LK Chong, EC Chang, MC Chan, AL Akkihebbal, WT Ooi " El-pincel: a painter cloud service for greener web pages," ACM Multimedia, 2012. 5 H Wang, L-S Peh, E Koukoumidis, S Tao and MC Chan, "Meteor Shower: A Reliable Stream Processing System for Commodity Data Centers," IEEE International Parallel & Distributed Processing Symposium (IPDPS), 2012. 6 K Thirugnanam, B Anand,, J Sebastian, PG Kannan, AL Ananda, RK Balan, and MC Chan, "Dynamic Lookahead Mechanism for Conserving Power in Multi-Player Mobile Games," IEEE INFOCOM 2012 Mini-Conference. 7 B Anand, AL Ananda, MC Chan, RK Balan, "ARIVU: Making Networked Mobile Games Green " A scalable Power Aware Middleware," Mobile Networks and Applications 6 (4), 21-28. 8 US Patent 8,230,106 Methods and apparatus for improved transmission control protocol transmission over a wireless channel exhibiting rate and delay variations, July 2012. 1 Manujnath Doddavenkatappa, Mun Choon Chan, AL Ananda, "Indriya: A low-cost, 3D wireless sensor network testbed," Testbeds and Research Infrastructure. Development of Networks and Communities (TRIDENTCOM 2011). 2 Manjunath Doddavenkatappa, Mun Choon Chan and Ben Leong, "Improving Link Quality by Exploiting Channel Diversity in Wireless Sensor Networks," RTSS 2011." 3 FC Choo, PV Seshadri, MC Chan, "Application-Aware Disruption Tolerant Network," IEEE International Conference on Mobile Ad-hoc and Sensor Systems (MASS), 2011 (short paper). 4 B Anand, K Thirugnanam, J Sebastian, PG Kannan, AL Ananda, MC Chan, RK Balan, "Adaptive display power management for mobile games," ACM International Conference on Mobile Systems, Applications, and Services (Mobisys) 2011. 5 M Doddavenkatappa, MC Chan, AL Ananda, "A Dual-Radio Framework for MAC Protocol Implementation in Wireless Sensor Networks," International Conference on Communications (ICC), 2011. 6 Hwee Xian Tan, Mun Choon Chan, Peng-Yong Kong and Cheng Khong Tham and Jicong Tan, "SAUCeR: A QoS-aware Slotted-Aloha based UWB MAC with Cooperative Retransmissions," Wireless Communications and Mobile Computing, 11(3), pp. 410-425, March 2011. 7 US Patent 7,944,820 Methods and devices for maximizing the throughput of TCP/IP data along wireless links, May 2011. 1 Liming Lu, Ee-Chien Chang and Mun Choon Chan, "Website Fingerprinting And Identication Using Ordered Feature Sequences," European Symposium on Research in Computer Security (ESORICS) 2010. (Acceptance Rate: 42/201, 20.8%). 4 Binbin Chen and Mun Choon Chan, "MobiCent: a Credit-Based Incentive System for Disruption Tolerant Network," INFOCOM 2010. (Acceptance Rate: 276/1575, 17.5%)"
5 Hwee Xian Tan, Mun Choon Chan, Wendong Xiao, Cheng Khong Tham and Peng Yong Kong, "Information-Quality Aware Routing in Event-Driven Sensor Networks," INFOCOM 2010. (Acceptance Rate: 276/1575, 17.5%)"
6 Shao Tao, Mun Choon Chan, Sergey Muravyov and Evgeny Tarakanov, "Pritrans: A Prioritized Data Transmission Scheme for Converge-cast in Wireless Sensor Networks," IEEE Sensors Applications Symposium, Limerick, Ireland, Feb 23-25, 2010. 8 Fai Cheong Choo, Mun Choon Chan and Ee-Chien Chang "Robustness of DTN against Routing Attacks," COMSNET, Bangalore, Jan 4-9, 2010. (Acceptance Rate: 31/153, 20%)"
This page is created by Mobashir and uses the Perfect 'Left Menu' 2 Column Liquid Layout by Matthew James Taylor. View more website layouts and web design articles.